Here is a repost on home made Easter Eggs. The best way to make sure that the treat you eat or are gifting to a celiac friend is gluten free is to make it your self. Source some gluten free chocolate for the shell and gluten free treats, gf jelly beans would be my sweet of choice, to hide in the egg. I am not the biggest fan of chocolate, in terms of dairy based treats I am more of a cheese girl however I do love the snap of crisp easter egg shell, cold from the fridge. I love holding a whole chocolate egg in my hand and whacking it inelegantly off the table top until it shatters, picking through the shards so I can alternate between slivers so thin they melt on the tongue and the thicker fragments where the cooling chocolate collected in swirls and ridges. I am still getting over the fact that you don’t find sweets nestled inside eggs anymore, that they are separately packed in the box and I am not sold on these pre halved eggs. I love that most people I know still get giddy about chocolate at this time of year. I like that I know people my age who still give up chocolate for Lent and who are now carefully planning exactly what kind of chocolate they are going to eat and in what order this Sunday. Is is possible to find Easter Eggs that are gluten free but they tend to be dark chocolate and designed more for adults than kids, so one year as she was making handmade eggs for all her grandchildren my ever resourceful Mum made my celiac nephew a milk chocolate egg studded with gluten free oreo cookies, I of course sat back with my camera and took notes instead of doing anything actually helpful. This isn’t the most detailed of posts, as I discovered that making home made eggs is a much simpler process than I had thought and just takes a bit of imagination and a willingness to get a bit messy to create some personalised Easter treats. This is more a list of basic instructions in case you have the time and the inclination over the next few days to play around with some melted chocolate and sweets. Sweets or cookies (make sure these are GF if making a gift for someone who is celiac) for decoration. My Mum used a gluten free Oreo type cookie as these are my nephews favourites. Melt one half of the chocolate either in a bowl over hot water or in a microwave at 30 second intervals, checking regularly. I can’t believe it is only just over two weeks to Easter, having Easter fall so close to St Patrick’s day is making this year trip along far to quickly. If you are celiac the options for easter eggs can be limited, my Mum meets this challenge by making her own, including the one above, studded with gluten free Oreo cookies for my celiac nephew. 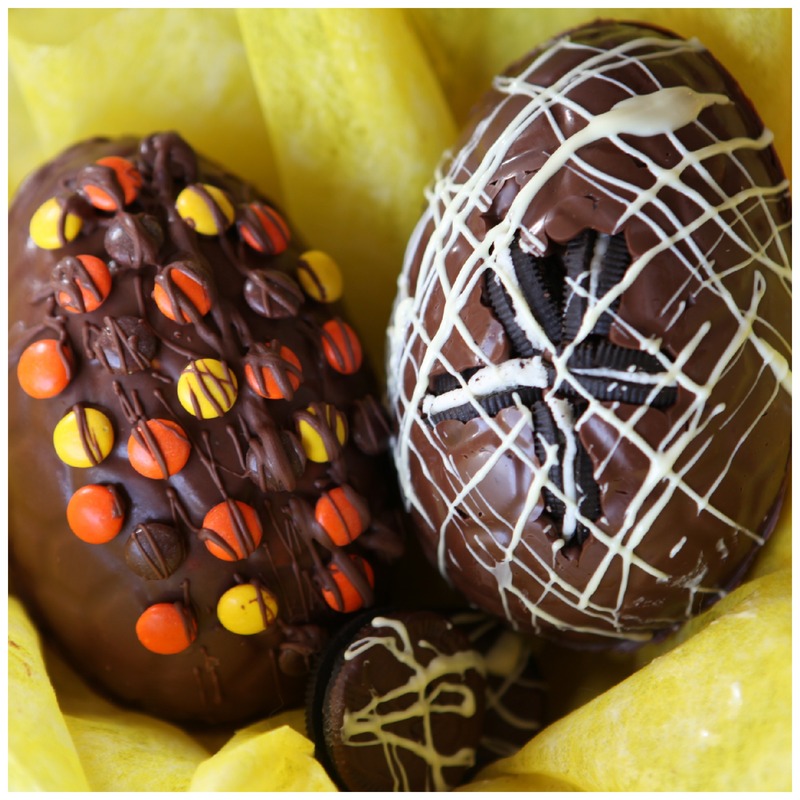 Here is a repost from last Easter on how to make homemade Easter eggs, last year I posted this after Easter, this year I am giving you enough time to make your own! Make sure your chocolate, candies adn any other decoartions are all gluten free if you are making a treat for celiac family or friends. The moulds for the eggs can be found in catering or cake decorating stores or online. When a retail giant like Penny’s, whose market strategy has traditionally been pile ‘em high and sell ‘em cheap, suddenly takes a leap into the eCommerce arena, you know there has to be something to this online retailing. From Tesco to Amazon, these massive retailers have recognised a shift in consumer behaviour. Customers no longer have the luxury of an hour for lunch with which to wander around the shops or time after work with which to do the grocery shopping. Nowadays lunch invariably consists of a hastily inhaled sandwich while manning the phone-lines and absorbing the latest updates through social media platforms, while grocery shopping is ordered sitting in traffic dreaming of dinner but making your way to the gym instead. Retailers have to fit into this new fast paced world to prosper. The manner with which they do this will be the difference between making enough to put bread on the table, or, making so much they manage to give the whole family gout. A company could be fortunate, like An Post, where this tidal wave of change carries them from one era to another seamlessly; as snail-mail dies a death, parcel delivery from online purchasing has increased dramatically, and looks set to continue into the future. Postmen are no longer shoving unwanted bills into spider infested post-boxes, but rather are more akin to Santa’s elves asking people to sign for little parcels of joy. However, if you are not so fortunate, you must then be a little creative. Online shopping offers the small and agile retailer a chance to reach the hearts and minds of their customers, and through that, their wallets. There have been leaders in this charge; C&A allowing the number of virtual likes to be shown above the product in their physical stores, Urban Hitlon Weiner giving credit to customers for posting selfies, Kate Spade creating a digital storefront. These strategies take advantage of activities in which their customers are already engaged and capitalise on them. 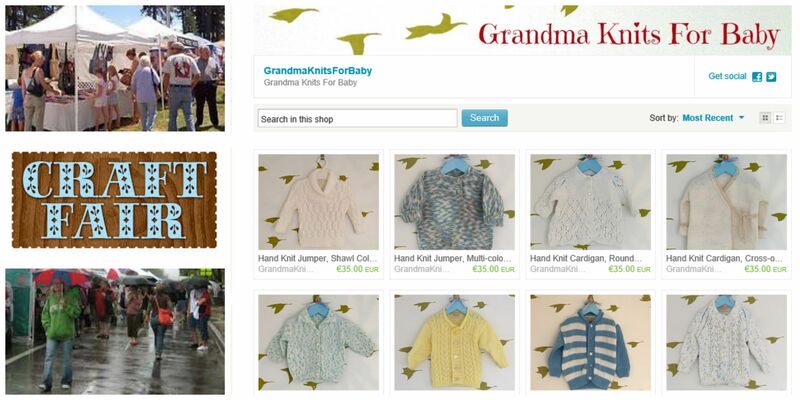 They convert product interaction into purchase opportunity, turning the passive consumer into an engaged advocate. All around us the traditional tools of retail are being adapted and modernised. “Customers who purchase this item also purchased…” has become the online version of sweets at the till. “Share this purchase” is the online equivalent of parading the bargain you picked up at lunch to your co-workers. “What other customers are looking at right now..” induces the same panic of a half empty shelf holding this Christmas’ must-have item. Communication is moving forward, and retail is moving with it. The new era holds untold opportunity to those who embrace it, ask HMV what happens to those who don’t. It was the bathroom project that would not end. In the length of time it took me to complete the work in this bathroom, away from the project I got pregnant, had a baby and returned to work. However, good work takes time, and this was the final flourish. In case you have forgotten the regeneration of this bathroom from sticky pink to masculine grey involved Getting Started, Painting the Walls & Tiles and Adding Soft Furnishing and now in part four, I am adding back a little decoration to make this room less utilitarian. The idea is to rearrange a familiar image, the way a Rubik-cube is rearranged in the middle of a game. People viewing the mixed-up image will unconsciously try to rearrange it to make sense in their minds. There were toys like this in the 80’s/90’s called sliders. I sought a familiar image that would fit my grey colour scheme and urban theme and found the Banksy picture of a maid sweeping dirt on a pathway underneath a wall. As the bathroom is a wet steamy place, the poster pieces will need to be encased in plastic, this is what the frames are for, and these are what will dictate the size the poster will be cut up into. To decide how many frames I would need I laid them out on the wall, empty for the moment. I could of course measured the space, decided on the space between each, and calculated how many frames I needed, but this way leaves no room for mathematical errors. The image I have works best if certain parts are whole, so for instance, I don’t want the maid’s face in two frames. To ensure this did not happen I laid out the frames on the poster and marked the layout. Once the layout was established I measured the poster and laid out the grid using the ruler and set square. I then cut the poster into squares. Each square was encased into a plastic frame which was then sealed with glue to help prevent the water getting in. I then laid out the pattern of the image rearranged on the bed, to get a feel for how it would look. I then stuck the frames to the wall. These hanging frames conveniently have a hole top and bottom so I choose to nail them to the wall, but you could use no more nails or something like that instead if you preferred. And there you have it the final flourish in a bathroom project which is finally finished! One of my favourite marketing images is when the beautiful girl wakes up on her bed in the middle of fairytale forest. I don’t care if you are selling fabric softener, cheap perfume or odor eaters – when this image is used I think the product is cool and I want it. Several bottles of fabric softener later I thought this might be a good theme for our bedroom. I wanted to have that feeling when you are dosing between dreams, in the twilight of dawn or dusk, and in the half light paintings and surroundings can seem real. I wanted to add visual cues that could be seen from my pillow that would prompt my subconscious to bring me to an empty quiet forest. I wanted this room to be calm and minimalist. Back in reality, what this really meant was that I wanted trees, flying birds and great blank spaces. The colour inspiration came from a trio of paintings of a tree which I bought in Next years ago on sale, with nowhere to hang them, I bought them just because I liked them – this is the way to pick artwork for your home. I started with the ocean of calm and painted all the walls white. 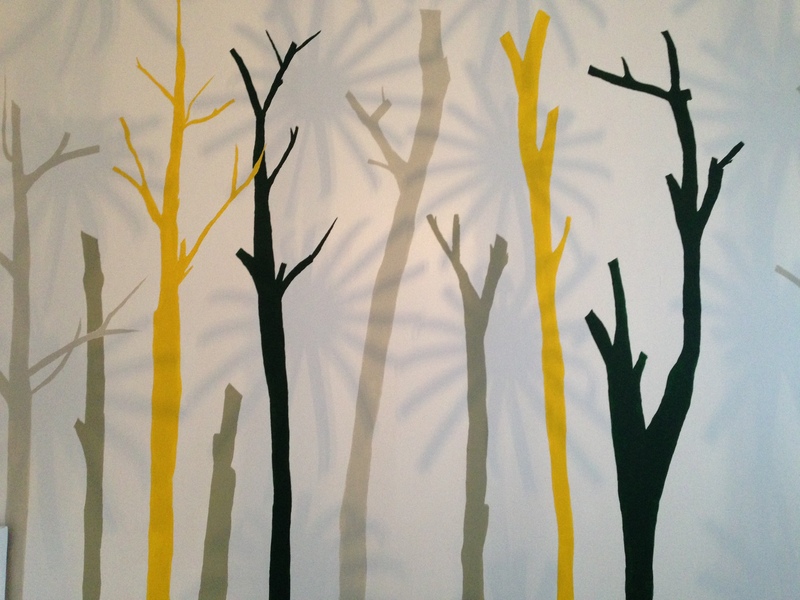 Then on the only wall without a window or door I painted trees in a contrasting pallet of green, yellow and grey. I’m not a wonderful artist so I kept things simple. The trees I painted are bare and recently cut-back. 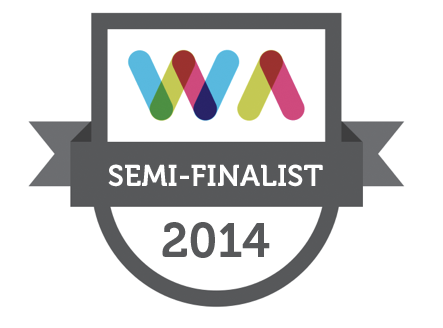 Shorn and bare; minimalist and simple; no unnecessary flourishes. 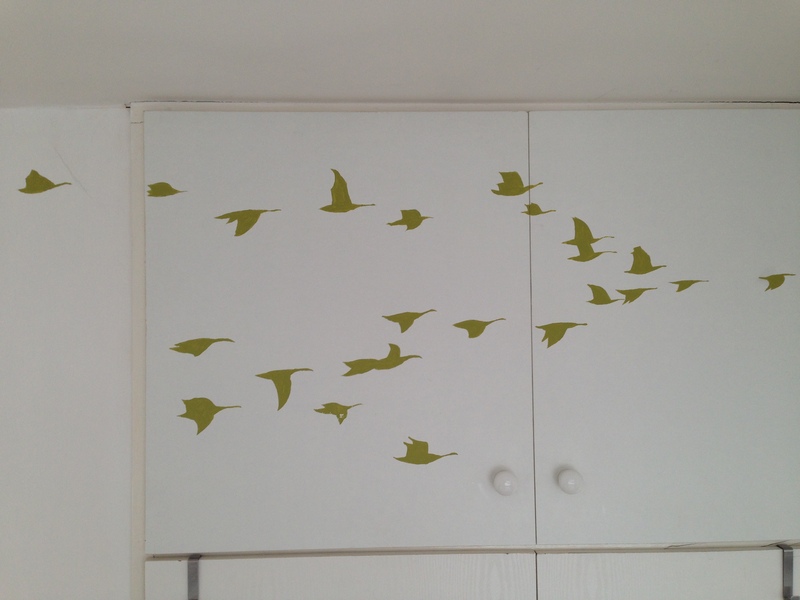 Then over the wardrobe in a contrasting lime green I painted a flock of geese in flight. On the door, I repeated the design of the trees and named the room. To paint I obviously removed all furniture and furnishings from the room. I added back only what was necessary. No curtains, no bedside lockers, no ornamentation. This room was an experiment in minimalism. I allowed only what was needed to make it a bedroom. I put in the bed. I tacked a green valance to the underneath to hide any clutter or storage below. This valance was lime green to tie in with the colour scheme. 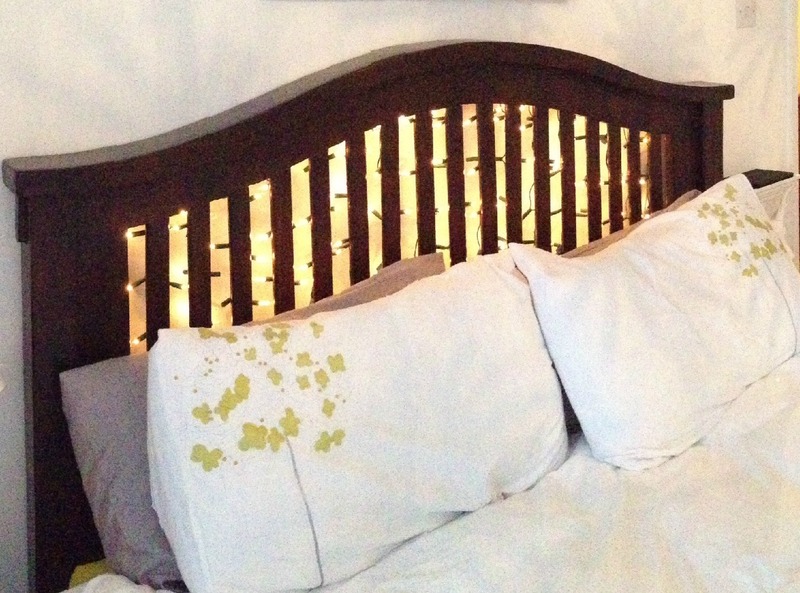 I tied fairy lights to the headboard to act instead of the reading lamps. I hung two antlers heads (which I got from Next, now out of stock I am afraid) either side of the headboard and hung two ‘shelves’ above them (which I got in Heatons, again now out of stock). These shelves measure 3cm x 10cm and are literally only big enough to hold glasses or a phone and a cup of tea. The room has a built in wardrobe, and I converted the ensuite to a walk in wardrobe last year, so there was plenty of storage for both of our things. That was it. Minimalist. No clutter. For a while that was all that was in the room. But we hit a snag. I had nowhere to put my makeup or brushes when I was getting ready. I started throwing it on the bed, but it wasn’t ideal. I crumbled and got a writing desk to act as a makeup table (from Oxfam, repainted). I felt because everything was contained within it, it conformed to my minimalist ideals. 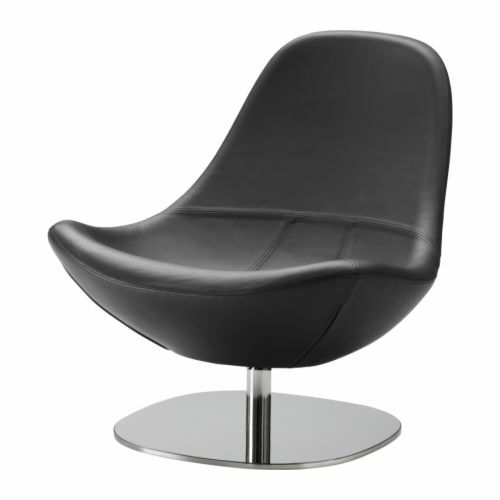 I also added a black leather chair (Ikea) for the clothes discarded before being re-hung or going to laundry. That just left me with my trio of paintings of the tree. Somehow, even thought they were the inspiration, their store bought, manufactured format no longer suited the room. So I decided to cut them up and nail them over another store bought painting (Dunnes) I no longer liked, but liked the contrasting colour and movement in the Dunnes picture when compared to the Next trio. I unpicked the canvases of the trio from their frame. The way they were designed was to have the painting be duplicated so that the sides of the canvas were not blank (this style was very popular in Homewares in 2006ish). This meant the canvases over lapped and added to the visual confusion of this image. 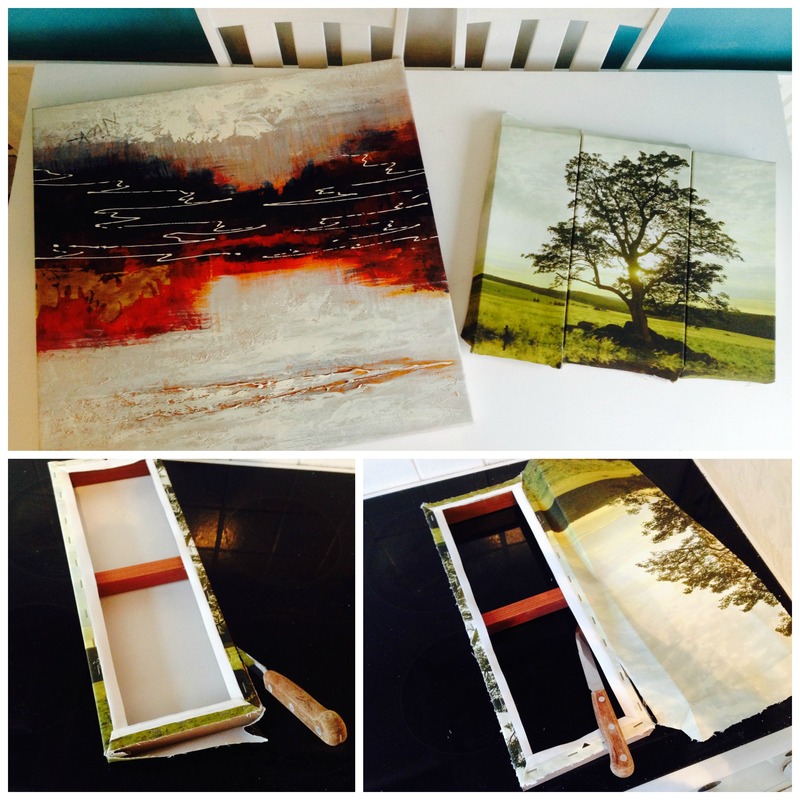 I cut all the canvases into inch wide stripes – getting a rough edge by tearing it with a knife. I discarded any duplicates that upset the image of the tree too much. I then nailed and pinned the torn canvases to the Dunnes picture. It gave me one painting, original and unique, but much better than I could paint myself. This should be fun, browse the internet for suggestions, there are approximately one billion Christmas decorations ideas out there. Be inspired and give things your own twist. For a gorgeous nightlight holder take a clean jam jar, and cut a length of card to fit around the jar. 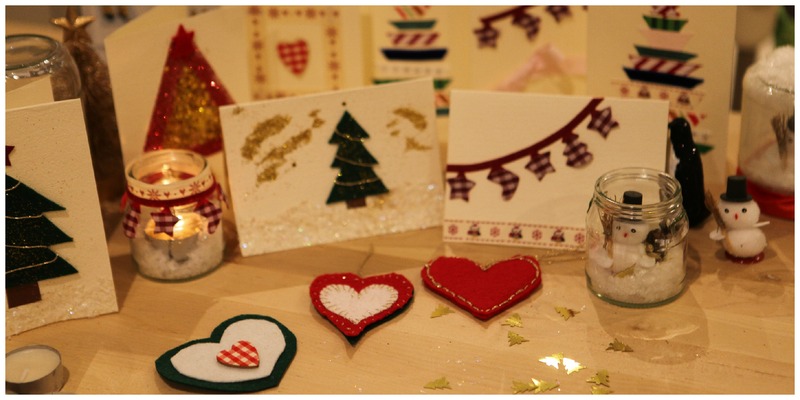 Draw a Christmas scene, gingerbread house, snow and, tree on the inside of the piece of card and then cut around the design , stick the card around the outside of the glass and lightly spray the jar with fake snow or glue and glitter for a sparkly effect. 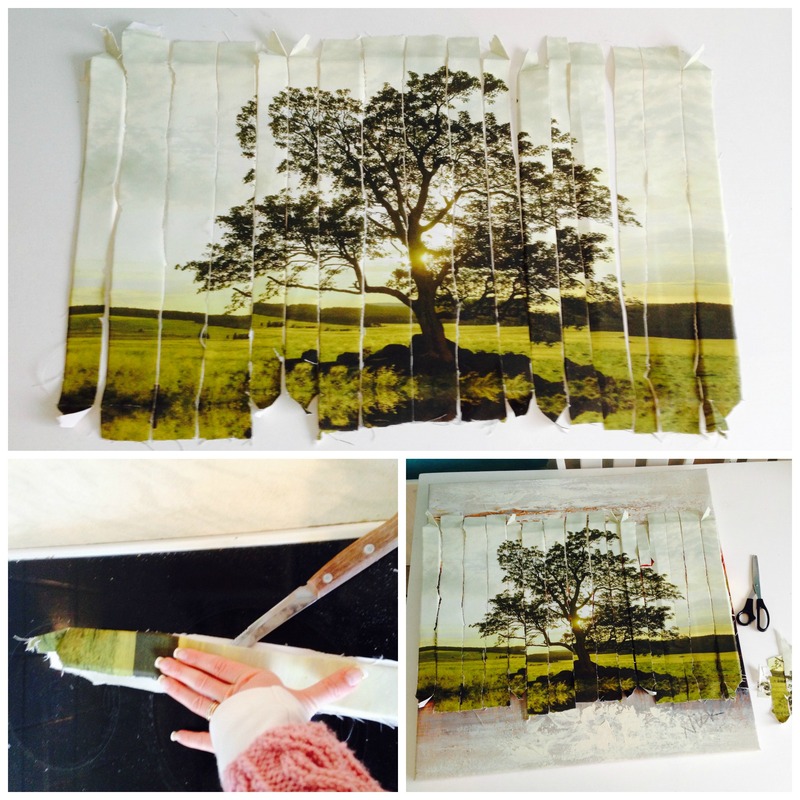 Allow to dry and then pop in your nightlight, The candle light will glow around the silhouette of your design and will be lovely against a dark window.